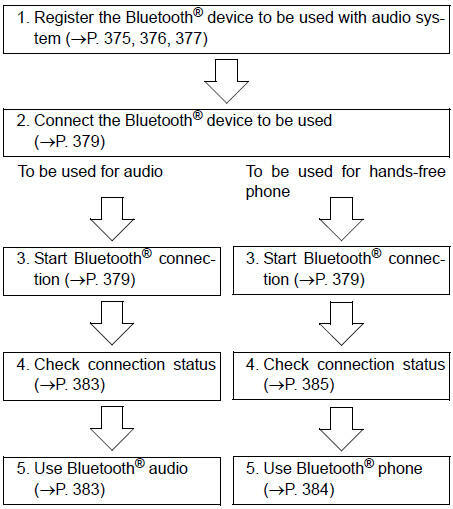 In order to use wireless communication, register and connect a bluetoothr device by performing the following procedures. The bluetooth� word mark and logos are registered trademarks owned bluetooth sig, inc. And any use of such marks by pioneer corporation is under license. Other trademarks and trade names are those of their respective owners. This equipment complies with fcc radiation exposure limits set forth for uncontrolled equipment and meets the fcc radio frequency (rf) exposure guidelines in supplement c to oet65. This equipment has very low levels of rf energy that it deemed to comply without maximum permissive exposure evaluation (mpe). But it is desirable that it should be installed and operated with at least 20cm and more between the radiator and person's body (excluding extremities: hands, wrists, feet and ankles). This device complies with industry canada licence-exempt rss standard( s). Operation is subject to the following two conditions: (1) this device may not cause interference, and (2) this device must accept any interference, including interference that may cause undesired operation of the device. This equipment complies with ic radiation exposure limits set forth for uncontrolled equipment and meets rss-102 of the ic radio frequency (rf) exposure rules. This equipment has very low levels of rf energy that it deemed to comply without maximum permissive exposure evaluation (mpe). But it is desirable that it should be installed and operated with at least 20cm and more between the radiator and person's body (excluding extremities: hands, wrists, feet and ankles). To display the screen shown below, press the "setup" button and select "bluetooth*" on the "setup" screen. Select to connect the device to be used with audio system. Select to register a bluetoothr device to be used with audio system. 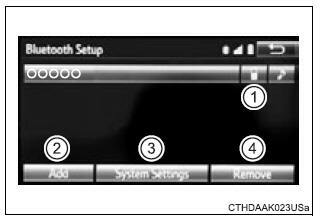 Select to set detailed bluetoothr system settings. Select to delete registered devices.